Gennison made of Elements SIGG Traveller Water Bottle (0.6L): Drink more water. With quality SIGG water bottles now fully customizable, even your sense of style will thank you. The aluminum SIGG Traveller (0.6-liter) screw top bottle fits into most standard cup holders, and minimizes taste-retention and residue buildup thanks to an aluminum lining that ensures a clean, crisp sip every time. Its sturdy extruded aluminum design means it'll be around to carry your beverages for years to come. Why toss out yet another plastic bottle, or let plastic chemicals leach into your water, when you could use a stylish, timeless SIGG bottle instead? Check out other products with this design or view all . 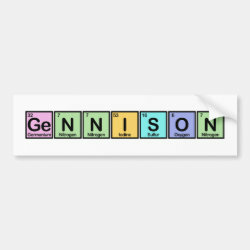 This sigg traveller water bottle with our Gennison made of Elements design is made-to-order by Zazzle.com. Zazzle offers 100% money back guarantee on our high quality Cute Union products. In case you are not happy with your purchase, you can always return your sigg traveller water bottle for an exchange or refund within 30 days of receipt. See customer service for more information.